We have a tradition around the winter holidays to take our grandchildren to a performance of the Christmas Revels. For those of you who are not familiar with the Revels, it is a lively, colorful performance of song, dance and theater featuring local singers, actors of all ages wherever the Revels is playing, now in nine cities across the United States. This year, we attended the original Revels, founded in 1971 in Cambridge, Massachusetts at Harvard’s Sanders Theater. This December, they featured the culture of the Nordic countries of Finland, Sweden, Denmark. Ashley and I took our young sons year after year just before Christmas to the celebration of Revels North in Hanover, New Hampshire. It is such a pleasure to now take Asher, age seven, and Delilah, age four, to hear many of the same songs and poems and to dance to the Lord of the Dance right before intermission. Here, now, this year and every year. This time of the shortest day and the darkest month of the year brought us a new grandchild! John Allen Cadwell, “Jack,” was born to our younger son, Chris, and our daughter-in-law, Leila on December 2, 2018. We were fortunate and so happy to spend Jack’s first three days home with him and his parents, helping, cooking, holding him and falling in love with the newest baby in the family. We are full of gratitude for our Christmas with all three grandchildren and our dear sons and their wives. With all the difficulties and challenges that we face in education and in many aspects of our lives on this beautiful planet, we are grateful for the beauty and quiet of the season and the love that we share. We send you all our warmest greetings as 2018 finishes and as we open a new year, full, once again, of hope and promise and all possibilities. p.s. We are now off on a January adventure. We will be in touch through Instagram and Facebook and we will be back with new year’s blog posts in early February. 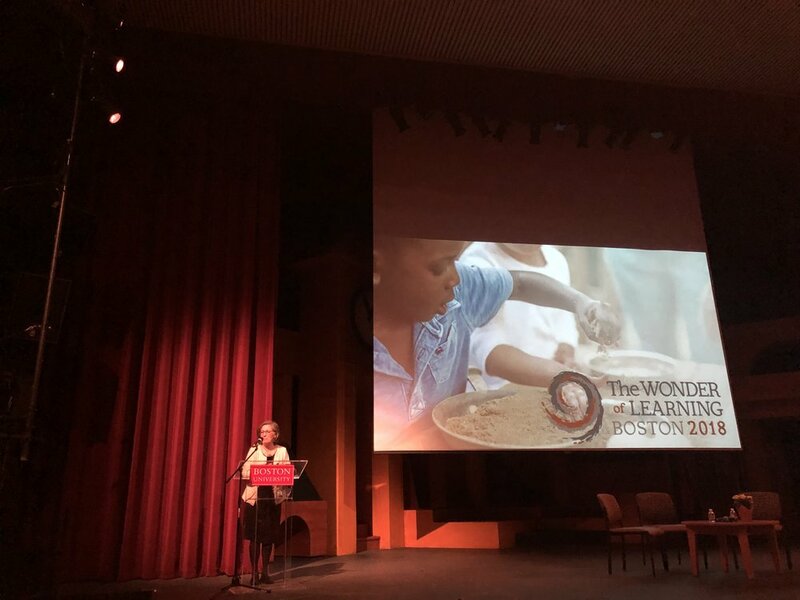 The Wonder of Learning exhibit from Reggio Emilia was in Boston from June through November, 2018, and has just departed for Madison, Wisconsin a few weeks ago. It was such a joy to have this exhibit in Boston. The leadership and organizers did an outstanding job generating and coordinating tours, workshops, initiatives, collaborations and conferences. The whole education community of Boston, of Massachusetts, and of wider New England is so grateful to have had the time to visit and revisit, and consider the inspiring and beautiful work from Reggio Emilia over the last six months. The last professional development day was focused on documentation and was organized for Monday November 12th when teachers had the day off for Veterans Day. Tiziana Filippini was the featured speaker from Reggio Emilia. Mara Krechevsky and Megina Baker from Making Learning Visible project at Project Zero at Harvard presented as well. I was part of a group of educators offering workshops in the afternoon that focused on documentation. Ashley and I were thrilled to see Tiziana in Boston. We have known her for 28 years and she is a dear friend. She was among the first Reggio educators I met when I attended a conference in Washington D.C. in the fall of 1990 when the exhibit then entitled The Hundred Languages of Children was at the National Children’s Museum. When our family arrived in Reggio Emilia in the fall of 1991, Tiziana was the pedagogista at the Diana School where I spent a good deal of my time that school year. Her daughter, Elisa is the age of our youngest son, Chris. Tiziana’s parents lived in the same apartment complex where we lived close to Scuola Diana. Our sons, Chris and Alden played with Elisa and other children in the courtyard and were treated to snacks by Tiziana’s generous and kind mother. At the conference on November 12th, Tiziana spoke to us without notes for over an hour. I was spellbound. She began by putting up quotes and images about the foundation of the work in Reggio Emilia. She said that she wanted to make sure that we understood, as much as possible, what they believe about human beings, school, and systems before she could speak to us about documentation. She quoted Jerome Bruner: The choice of one model for the human mind rather than another has political and social relevance. She told us that in Reggio Emilia, they view and build their educational project on the premise that school is a living system that is ecological and systemic…that these parts form an interdependent whole: the “ecology” of the environment, spaces and relationships; family involvement and exchange over long periods; building relationships and involvement with the town of Reggio; the atelier and the 100 languages; life long professional development and collegial work and exchange; and projection, documentation, observation, interpretation and relaunching learning. She said that the curriculum is not just about the disciplines, rather it is an ecological system of knowledge and teaching and learning strategies. She told us that documentation is not an end game…not a follow up of a finished process, but rather an essential practice of learning for every protagonist, the teacher, the child and the parents. She continued to use the analogy of learning about trees throughout her talk. She referred to the activity of giving children brown paper for the trunk and green for the leaves and telling them how to put a tree together…how to represent a tree. (She had observed this in a school in North America.) She asked us to think about what assumptions we have if we ask children to do this…What is the relationship we hope that they might develop with trees? With the natural world? With knowing trees as living elements as part of our world? With the diversity of kinds of trees? With all parts of trees and the network of relationships with the earth, the sun, the sky, creatures. She told us that we are talking about children’s relationship with the natural world which we hope will be authentic, deep, and beautiful. When I lived in Reggio Emilia, I followed a long project on plants and trees with the 4-5 year old children, with teachers Paola Strozzi and Marina Mori, atelierista, Vea Vecchi, and pedagogista, Tiziana Filippini. I wrote about this project in chapter three of Bringing Reggio Emilia Home. I lived inside the ecology of the system of school that Tiziana described in her talk and inside the project about the relationships among the children and the trees. I am so grateful for that and for the opportunity to write about it. 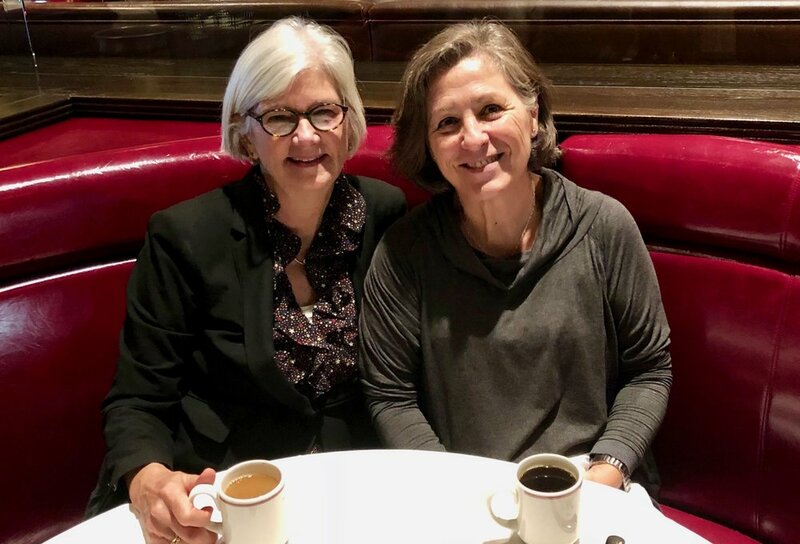 I am full of gratitude also for the chance to spend time with Tiziana in Boston, and for the community, far and wide, that continues to be inspired and to stretch and learn from the work in Reggio Emilia, Italy. May we all be grounded in the presence and beauty of learning on this earth alongside children, and may we all continue to reach for the stars. This Thanksgiving holiday, we are with Ashley’s extended family…his five brothers, spouses, nieces and nephews and a few family friends. We are gathered at the farm in Vermont where Ashley grew up with his brothers and where eight generations of this family have lived. We are in two houses across the barnyard from one another with a classic white barn in between. To the west, we look out at the now snowy Taconic Range and, to the east, over the fields and hills. Our own sons and their families and are not here this Thanksgiving, so we miss them. This is the first holiday without Ashley’s mother, who died last spring and we miss her. And yet, her presence and love is everywhere. Many of us have had some bumps and illnesses, injuries and challenges, like every family. Being together in a warm and honest way in this place sustains us. One of the traditions that we have cultivated over the years is to have a family circle before the Thanksgiving meal. We used to stand in a circle and say briefly what we were thankful for. This tradition has evolved into more of a Quaker Meeting style sharing where we sit in the big room with a fire and speak about what really matters to each of us. It is a beautiful weaving of story, gratitude, struggle, sadness, kindness, support and love. This November we are also waiting for the newest member of the family, due to be born to our son, Chris and wife, Leila any minute. This Thanksgiving we are grateful for our family circles, our friend circles, our educator circles, and the beauty of the earth where we all live.. Each enriches our life and makes us whole. We love David Steindl-Rast’s view of gratefulness that he has written about in his books, and spoken about in a TED talk and also in this five minute youtube video that is beautiful and accessible. Be sure to watch it with family. Happy Thanksgiving weekend to each of you. We send all of you our very best wishes for a beautiful holiday season. I hosted Harold Gothson here in Middlebury, Vermont this past week. The Permanent Fund for Vermont’s Children had invited Harold to speak with them about his experience in Sweden where he and his colleagues have established a high functioning network of early childhood educators. I wrote about Louise’s and my experience with Harold in Sweden two years ago. Harold has been an observer of and thinker about the Reggio Emilia approach since the 80’s and has integrated and adapted many of the principles and practices in his Swedish early childhood education context, especially with the collaboration of Anna Barsotti and Gunilla Dahlberg. Together they established the Swedish Reggio Emilia Institute. The Permanent Fund for Vermont’s Children has declared their intention to develop a fully realized Strategy to achieve affordable access to high-quality child care for all Vermont families by 2025…a lofty goal, even audacious in these times. When I first read about this initiative, I emailed the director, Aly Richards, to ask for a meeting. At our meeting, after listening to Aly’s description of their work and their intentions, Louise and I volunteered our support. Harold pointed out that much of educational research on learning most often is discussed as neutral in value issues or is turned into methodological advice…group learning is looked upon as a method instead of being seen as a basic aim for the learning process. Harold described his Swedish colleagues’ profound connection with Reggio Emilia. In Reggio Emilia, we met not only a celebration of beautiful principles and declarations about children. We met a local society experiencing the idea of preschools as a democratic force that inspires the development of the identity of a city. It was an idea that inspired not only teachers but also local political thinking and acting, as well as empowering a new citizenship by developing participation of families in the everyday life of the preschools. Here we could see and touch a practice that showed that democracy is not fulfilled by the pure right of voting. Democracy demands that the most important role of a school is to support the possibility to formulate and respect your own viewpoints AND to put your viewpoints in to negotiations with your peers so that you can learn together…and learn the strategies that turn conflicts into energy. This is a societal shift we are trying to make - it’s so much bigger that a bill or a funding ask. We really need to change the cultural perspective of early childhood and the value we place on our children. Our learning environments - this includes the children and the families - should be seen and treated as learning communities where we practice the skills needed to understand and actively engage in democratic society. The outside world is the “school,” the school building is the lab or studio. Children’s best learning is directed by themselves, with teachers as guides…a learning community in which the adults put the emphasis on wondering rather than conducting. You can learn more, volunteer, and invest in the Permanent Fund and this on going work. Vermont intends to lead the way with strategies and models for other states and communities. We need this kind of leadership! Thank you to the Vermont Community Foundation, to the Permanent Fund, and thank you to Harold Gothson for inspiring us all to think widely and broadly about the dynamic, big picture and values that are the foundation to this vision. As a child, I loved the sandbox behind the house, next to the calf pasture in a barnyard on a 250 acre dairy farm in the middle of Vermont. My earliest memories are of constructing roads and villages with my neighborhood buddies. While we fabricated entire civilizations out of sand and sticks and straw, the calves grazed and blatted in the background. When we weren’t outside, we were inside the house “making”: trains of chairs for long cross country trips to California; dens of blankets over stools and chairs for secret societies; stage productions born out chests full grandparents’ and parents’ old clothes and shoes; grand banquets served from cauldrons (old tin pots) on fine china and silver (reclaimed dented plates and bent tin flatware). We even had a studio of sorts. My mother was an architect and she loved to sketch. I used to watch her drawing at her drafting table as I played with blocks on the floor at her feet. In our home, it seemed as if the possibilities for invention were endless. So, the sandbox is both a place and a metaphor for me. It’s a comfortable place, just the right size, with just the right kind of natural and repurposed materials where a congregation of children can invent...endlessly. It’s also a symbol of how all of “school” can be organized and run. Fortunately, I’m not the only one who believes this. There are many inspiring developments in playground design these days and many resources available. We are thrilled to see Design and Play in print, a book based on the research and exhibit of the Design Museum in Boston, featuring playground design from around the world, now touring in San Francisco. From Asphalt to Ecosystems, a book by our colleague, Sharon Danks, also features playgrounds and outdoor classrooms from around the world and many practical, helpful strategies for design. We draw on these and other resources when working with schools and educators in playground and school design. I designed and built the current playground at the St. Michael School in St. Louis and I’ve helped other educators design playgrounds. We are currently helping to design a playground for a school in St. Louis. I am always struck by one simple guiding principle: we might think of playgrounds in the same way that we think of classrooms…they are just bigger, so gross motor experiences are prevalent. The importance of the organization of space and the careful choice of materials is the same. Here are six overarching patterns that guide my thinking when designing a playground. First: Spaces open from a building to a large open area covered with a soft surface, like the KORKAT two layer poured in place soft surface (choose a NEUTRAL color). Think of the large space as a piazza…for running, biking, scooters, ball games, large gatherings…surrounded by ever more intimate spaces. Think: a space for 20-40, or more…to spaces for 4-6…to spaces for 1-2. Second: Around the large open area, think of placing different small group (4-8) gross motor activities: swings, slides, monkey bars, sand boxes, climbing frames, etc. Third: Use the natural topography as much as possible…for a small amphitheater or a bridge. Here’s a slide build into a little hill. Fourth: Use natural materials that present interesting physical challenges…as simple as 24-36 inch diameter logs cut into 4 to 12 inch disks…laid out in a flat area…for hopping, jumping…or just sitting. They can also be rearranged by the children. Here is a “vehicle” carved out of a log. Of course, the two most generative, and easily accessible materials are SAND and WATER. Sixth: design spaces for 1-2 children around the periphery. Usually, and somewhat ironically, the outside wall of the building affords lots of opportunity for this…especially when you think of water…sinks in counters along the building wall with work tables for an outdoor studio. A building’s exterior inside corners can provide a place for a table and shelves. A pile of 4-6 foot tree limbs or pallet boards that can be formed into a teepee or a fort. A 6 to 8 foot amphitheater dug into a slope. I just thought of a SEVENTH: build the playground in stages, starting with the big space and two or three of the middle and small spaces. Observe how the children use the spaces. Think with THEM what else WE might add. Then create the additions, one at a time, and CELEBRATE each one. Or better yet, start by asking the children and the community, and imagining with them their dream playground, a strategy that Sharon Danks outlines in her book…and then, build it in stages.